29" x 60" x 26"
This desk was made for a New York City residence where Chinese antiques harmoniously blend with Arts and Crafts era furniture in a warm, modern environment. The challenge was to continue the style of the home and still create a distinctively unique piece. The influences on this piece are both Danish modern and ancient Chinese; the result is "Dasian" (Danish/Asian). It is clean lined like all good Scandinavian design. The Chinese influences are in the modified hoof feet and the upturned breadboard ends, but these are sleeker details than seen in antiques. 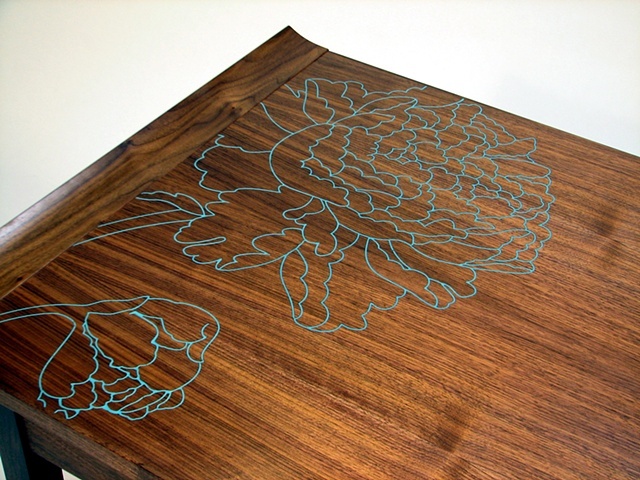 Drawings of peonies are inlaid into the walnut desk top. The peony is a sign of good fortune in Chinese art, and happens to be the client's favorite flower.